With the Elections for Hostel Councils and the posts vacant in SLC coming up this August the 24th, we take you through the official information you need to know before voting. Firstly, the elections of the Hostel Council usually take place in the even semester. Here’s why we are voting now: Who Moved My Elections? 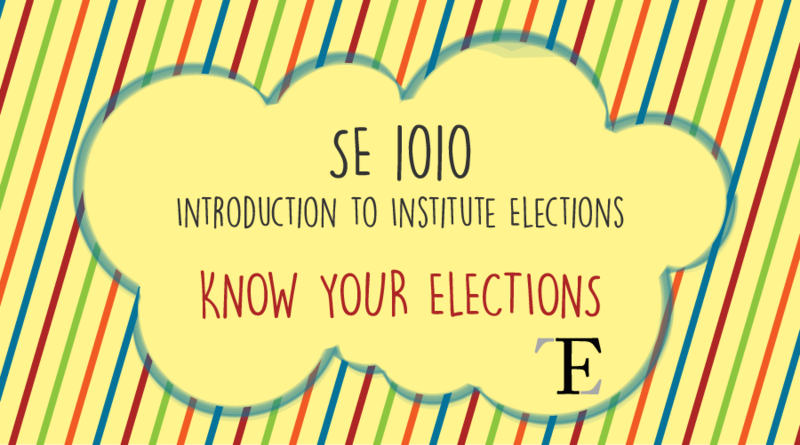 Secondly, about the process of voting, here is a delightfully illustrated article, SE1010: Introduction To Institute Elections. The detailed roles and responsibilities of each of these posts can be found in the Students’ Constitution. Note: The post of Cultural Secretary(Literary) has fallen vacant after the Executive Council Elections in the odd semester. SLC is given all the legislative powers of the General Student Body(GSB) and is intended to be the primary enforcer of the Students’ Constitution. Know more about the SLC here: Know Your SLC: The Students’ Constitution. Student Legislative Council comprises (you guessed it) Legislators with the Speaker as the presiding officer. Four Legislators: represent postgraduate students pursuing two year postgraduate courses in engineering/technology. The Speaker is elected by the Legislators of the Student Legislative Council. S/he cannot take up responsibilities that are in the line-of-command of any other member of the Executive Council. Ensuring the smooth functioning of Student Legislative Council and Legislative Committees. Maintaining up to date records of Constitutional amendments, minutes of SLC meetings, etc. Read a little more about the functioning of the SLC here, from its days of being SAC . The Department Student Body (DSB) shall decide policies with respect to its own Department in accordance with the Students’ Constitution and the Department Council is responsible for taking decisions and implementing them, consistent with the policies set. In addition to the responsibilities of the Department Legislator(Academic), the Research Councillor shall, while not being on the SLC, by default, be part of the placement team headed by the Research Affairs Secretary. Hostel Council is responsible for taking decisions consistent with the policies set by the general body of the hostel, and their implementation. A General Body Meeting is for discussing issues of the hostel’s interest, to pass policies and the Budget of the Hostel Council, and to review the performance of the members of the Hostel Council. Each hostel has one Hostel Council. Health and Hygiene Secretary: Takes primary responsibility of taking charge of maintaining cleanliness in and around the hostel premises and for the functioning and training of the hostel housekeeping staff.